This week was the Kindergarten "Lunch with Someone Special" event at school. 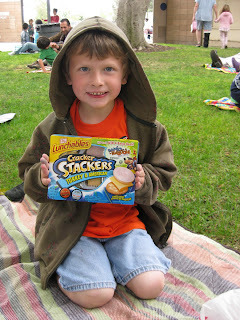 I brought Ben the one thing that he always begs for but never gets, Lunchables, and a picnic blanket. He's our little social butterfly and scarfed his food down as fast as he could so he could go chat with his friends, leaving me feeling less than special! I packed up the remains of our lunch and waved him over so I could say goodbye and he gave me a giant hug and several kisses, telling me I was the best mom ever. So, I guess I'm pretty special after all! My kids ask me when they are/were younger to come and have lunch with them all the time too. They do the same exact thing - run off with their friends. But, they remember that you came.